Our CIT program is open to boys and girls entering 9th and 10th grade. 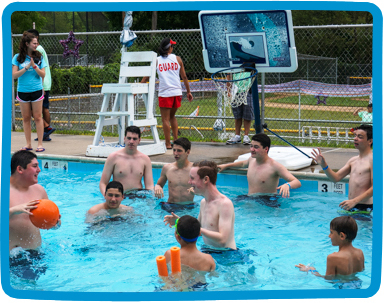 In addition to participating in traditional camp activities, CITs gain valuable experience working with children. Our CITs spend part of the day following a regular camp schedule, and the rest of their time working with a specific group at camp. Assisting counselors at activities and engaging with younger campers helps prepare them to be real leaders at camp. CITs acquire leadership skills, while still enjoying a fun camp experience. Our CIT program includes weekly field trips, a community service project, and two overnights. Throughout the summer, CITs receive training on topics such as behavior management, effective communication with staff and children, and being a positive role model. They also take part in teambuilding activities that emphasize self-confidence and enhance group cohesion. Our CIT Coordinator oversees this age group, managing all schedules, programming, and training.